The first Hawaii Invasive Species Awareness Week (HISAW) was held March 4-8, 2013 and was planned to coincide with National Invasive Species Awareness Week. Events for the 2013 HISAW included a kick-off event at the State Capitol, a Governor’s Proclamation, HISC Awards, a statewide BioBlitz to connect individuals with scientists to identify species in their own backyards, and a series of volunteer events across the state. 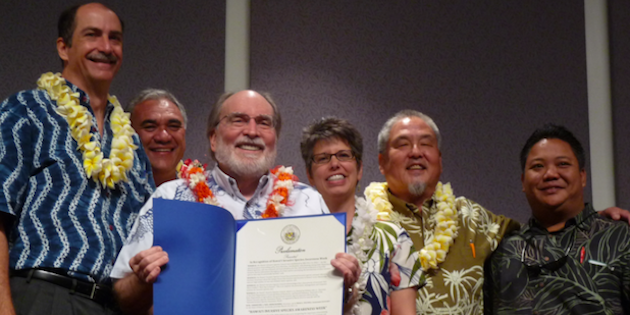 In 2013, Governor Neil Abercrombie proclaimed the first Hawaii Invasive Species Awareness Week (HISAW), from March 4-8, 2013. His address to the audience at a HISAW kickoff ceremony at the Hawaii State Capitol on March 4 focused on the need to whatever resources are available to mitigate invasive species impacts and protect our valuable natural resources, economy, and way of life. He referenced the Hawaii state motto, Ua Mau Ke Ea O Ka ‘Aina I Ka Pono, and said that we all must do what is pono in protecting Hawaii. The official proclamation of the first Hawaii Invasive Species Awareness Week was presented to the Hawaii Invasive Species Council. HISAW 2013 included approximately 15 volunteer opportunities across the state, including invasive plant control from Kokee to Keauohana, from the shoreline of Kaneohe Bay to the slopes of Mauna Kea, and including other educational opportunities such as radio trivia contests and informational booths. The kickoff to the first Hawaii Invasive Species Awareness Week including the first Hawaii Invasive Species Council Awards ceremony, in which eight individuals and organizations from across the state were recognized for their contributions to protecting Hawaii from invasive species. The eight winners, along with a number of honorable mentions, were selected from approximately 40 nominations. The Kauai Invasive Species Committee (KISC) is a voluntary partnership of government, private, and non-profit organizations, and concerned individuals working to prevent, control, or eliminate invasive plant and animal species on Kauai. While mongoose have been suspected on Kauai for several decades, no live mongoose had ever been captured. In May 2012 KISC staff captured a live mongoose near Lihue. In June 2012 they did it again, capturing a second live mongoose near Nawiliwili Harbor, with assistance from Young Brothers, Ltd. KISC, acting in cooperation with the Dept of Land and Natural Resources Division of Forestry and Wildlife, the U.S. Fish and Wildlife Service, Kauai Lagoons Marriot and others, provided the first conclusive evidence of mongoose on Kauai, highlighting the need for further protection of Kauai’s endangered seabird populations. In 2012 KISC also declared Kauai coqui-free, following the monitoring of a multi-year eradication effort of coqui near Lawai in cooperation with the Hawaii Department of Agriculture. KISC’s consistent efforts and stalwart collaborations paid off big time in 2012, making them an excellent recipient for Greatest Hit of 2012. Scott Godwin has gone above and beyond his resource protection role for the Papahānaumokuākea Marine National Monument ever since the devastating earthquake and tsunami in Japan in March of 2011. He has been steadfast in his commitment to providing assistance and expertise as Hawaii has begun to see the marine debris generated by that tsunami. He’s not one for the spotlight; always humble and behind-the-scenes. One of Scott’s areas of expertise is in alien species identification, particularly of invertebrates. In the US, over 150 alien species (numerous invertebrates) have been identified on Japan tsunami marine debris found. Scott works in tandem with the State Dept. of Land and Natural Resources and with aquatic invasive species experts from all states dealing with this marine debris. Additionally, he has provided guidance and co-authored a state response guide to alien species on Japan tsunami marine debris. Because of Scott, there is now protocol and guidance for dealing with alien species in both the Main and Northwestern Hawaiian Islands, and a greater awareness of the potential alien species impacts of marine debris. 2013 Business Leader Award: Young Brothers, Ltd.
Young Brothers, Ltd, provides large-scale movement of cargo goods in the State of Hawaii. While cargo transport can be a primary vector for invasive species to travel from island to island, Hawaii is fortunate to have Young Brothers as a proactive participant in ensuring that the risk of transporting invasive species is minimized. In 2012 Young Brothers continued to engage with the Hawai‘i Department of Agriculture, ensuring that goods were inspected and that surveys could be conducted for pests such as the Little Fire Ant (Wasmannia auropunctata). On Kauai, Young Brothers staff reported and assisted in the capture of a live mongoose near Nawiliwili Harbor, only the second live mongoose to ever be captured on that island. 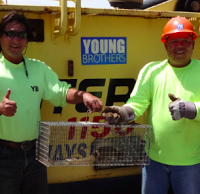 Incorporating environmental concerns into their business practices, Young Brothers provides an example of industry and conservation working side by side. Mary Begier and the Hawaii Island Chamber of Commerce demonstrated their commitment to both community-based stewardship of public lands on Mauna Kea as well as to fulfilling pledges by the Chamber to support the University of Hawaii at Hilo in its efforts implement existing management plans. Mary and the Chamber helped the Office of Mauna Kea Management reach out to segments of the community which had not previously been engaged in invasive species control efforts, while at the same time provided feedback critical to designing a community volunteer program which not only assists with invasive species control but also promotes dialogue and understanding among volunteers. 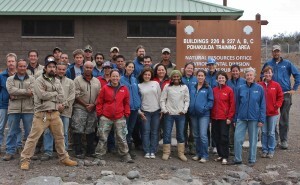 Short-term impacts from their efforts in 2012 include over 110 volunteer days, spending more than 800 volunteer hours, and pulling several hundred of bags of invasive species from Mauna Kea. Their efforts will help restore native forest and provide habitat for the endangered Palila. Being the sole employee in his department, Craig Kaneshige spends his efforts on a variety of invasive species including insects and plants. He conducts surveys for invasive insects like nettle caterpillar, small hive beetle, varroa mite, and other agricultural pests. He collaborates with the Hawaii Ant Lab and KISC on little fire ant control and detection, and works tirelessly on plant pest species including miconia, long thorn kiawe, and Moluccan raspberry. Kaneshige also is a dynamic member in the Kauai Conservation Alliance and actively interacts with many conservation groups on Kauai offering his experience and expertise. Craig’s work in early detection of plants, insects and pathogens, although hard to measure, will help ease the impacts that invasive species have on agriculture and the biodiversity of Kauai’s natural areas; perhaps even saving industries (like honey production and the services that bees provide), and endemic species that are already dealing with a host of pressures that threaten their survival. Mashuri Waite has been pro-active in identifying and removing high-threat invasive plant species from Lyon Arboretum’s collections to prevent those species from spreading and doing harm to Oahu’s natural resources, economy and quality of life for residents. His efforts include working with botanists from the Oahu Early Detection program to identify and assess the feasibility of removal of high-threat invasive plants in Lyon’s collections and collaborating with the Oahu Invasive Species Committee (OISC) to host and assist OISC’s volunteer program removing targeted invasive plants from Lyon Arboretum. To date, Mashuri has worked with OISC’s volunteer program to search over 63 acres of ground and remove over 9,600 targeted plants. Mashuri’s direction and efforts will hopefully lead to the complete eradication a number of these high-threat species from Oahu. Pete Vorhes is the chief pilot for Windward Aviation on Maui. Having spent over 20 years flying in Hawaii he’s intimately familiar with the weather and terrain, yet not intimidated. He works with conservation crews throughout the state whether it’s flying fencing material to protect watersheds on Maui or helping stop the sea of Australian tree fern on Kauai. Peter has even volunteered his time to come out on the ground with crews to see what it’s like and how he can help from the air. Peter is never off the clock—he’s always on the lookout for invasive plants and animals he may spot, recording or remembering precise locations to return to later. During 2012 Peter was instrumental in bringing herbicide ballistic technology from the experimental phase to the fully operational level. This new technology has the potential to dramatically alter aerial invasive plant control in Hawaii and Peter Vorhes is as committed to the project as anyone involved. The Hawaii Cattlemen’s Council has been a critical partner in the development and release of a moth from Madagascar (Secusio extensa) as a biocontrol agent to control invasive fireweed (Senecio madagascariensis). Fireweed is toxic to livestock and is spreading rapidly across Hawaii Island and Maui, outcompeting other plants. Over a decade of study by the Hawaii Department of Agriculture went into ensuring that the moth from Madagascar would feed only on fireweed and not on other plants in Hawai‘i. The Hawai‘i Cattlemen’s Council helped the biocontrol through the federal approval process to be released as a biocontrol agent in early 2013. Now that the moth is being released, the Hawaii Department of Agriculture and the Hawaii Cattlemen’s Council anticipate that the moth will slow the spread of fireweed, limiting its environmental and economic impacts. The Natural Resources Office of the Pohakuloa Training Area (PTA), located in the Saddle Region between Mauna Kea, Mauna Loa, and Hualalai on Hawai‘i Island, is responsible for protecting 19 federally-listed threatened and endangered species at PTA. The Natural Resources Office employs 50 staff, who in 2012 completed 7 miles of a 62 mile ungulate fencing project slated for completion in 2013. Staff also removed invasive plants by hand and conducted incipient weed surveys to ensure that new introductions of invasive species weren’t occurring at PTA. Overall, 60% of the Natural Resource Office’s budget was directed toward invasive species prevention or control in 2012. HDOT Highways Division recognized a growing problem within its purview of providing safe and efficient travel ways: invasive plant and animal pests, many whose primary vectors of spread are roads, vehicles, and highway construction and maintenance equipment and machinery. 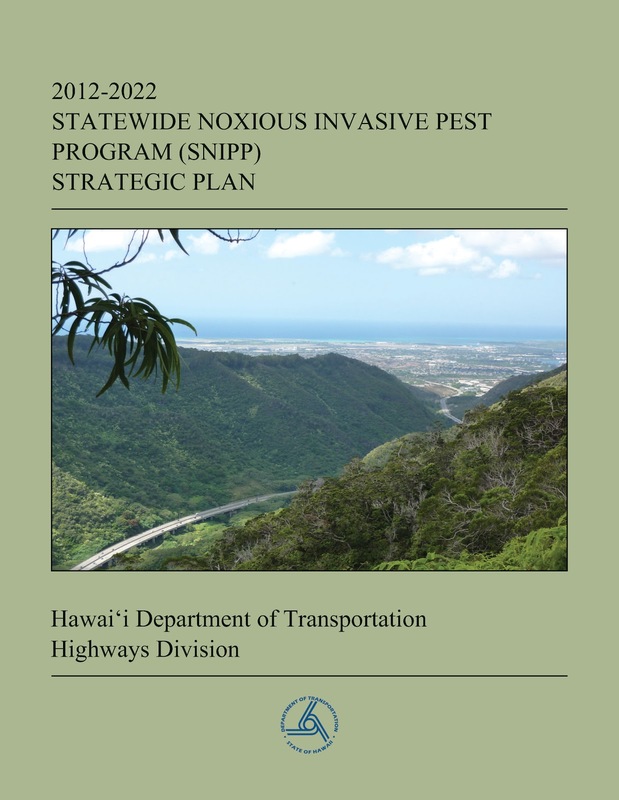 Highways Division launched the Statewide Noxious Invasive Pest Program (SNIPP) – the largest effort by any DOT in the nation to mitigate the problem of invasive species. Over the last three years, through SNIPP, the Highways Division has developed a 10-year SNIPP Strategic Plan, conducted invasive species workshops for HDOT maintenance staff, developed best management practices for preventing and controlling invasive species along highways, and provided funding for the O‘ahu Invasive Species Committee to detect and control invasive plant species along roadways. Highways Division has inspired and equipped their staff and contractors for the prevention and control of invasive species. HDOT’s environmental stewardship serves as a role model for other non-conservation agencies to do their part to protect our economy, environment, and healthy from the irreversible impacts of invasive species. As a wildlife biologist, Fern Duvall has had a long and varied career in conservation, and is considered a local expert on plants, birds, pathogens, and just about everything else. In the late 90’s, Fern responded to the first coqui report on Maui and tracing it back to a nursery. Fern was also the first to alert Maui to the presence of veiled chameleons, a pest that has since been controlled below detectable levels. Fern is a key part of rapid response to snakes in Hawaii and caught the first live ball python in Makawao 12 years ago. 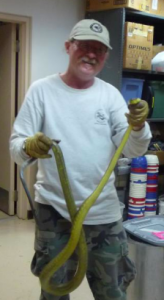 He remains an active part of the response team for invasive brown tree snakes (Boiga irregularis) if and when they are reported in Hawaii. Fern’s incredible breadth of work and tireless enthusiasm for conservation have contributed to protecting Maui, and the State, from invasive pests. 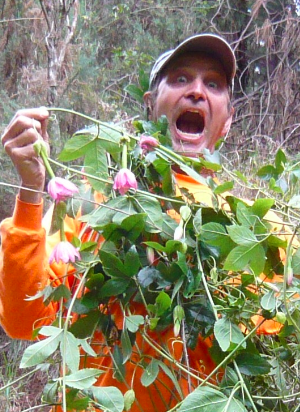 Dr. Arnold Hara has a history of going “Above and Beyond” when it comes to invasive species. Although an entomologist by training, Dr. Hara has responded to every new significant pest to hit the Big Island with one exception: Axis deer. 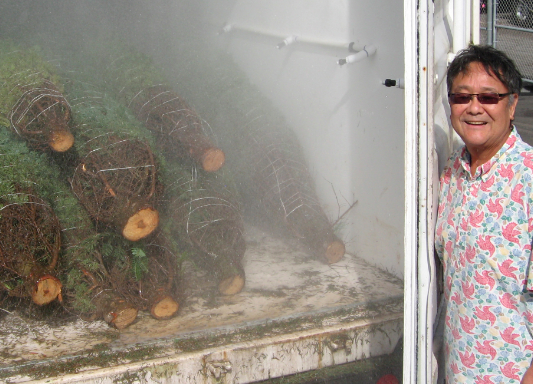 In 2012, Dr. Hara has been involved in over half a dozen projects involving invasive species. These projects range from detection of coconut pests and diseases to managing pests to help our potted plants and cut foliage exporters export their products. In addition he has tested chemical treatments for new pests such as the ficus stem and leaf gall wasps, mealybugs and scales affecting protea, and the Fiorinia scale. Dr. Hara’s ability to address a variety of invasive threats and his dedication to his work serve as an example to Hawaii’s conservation community. Honorable Mention Business Leader: Kailua Sailboards and Kayaks, Inc. 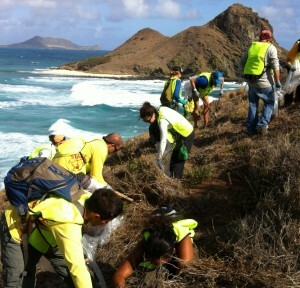 In February of 2012, Kailua Sailboards and Kayaks, Inc. (KSK) began volunteering it’s manpower and services to the DLNR/DOFAW’s offshore island restoration projects on the Windward side of Oahu, which continue to this day. 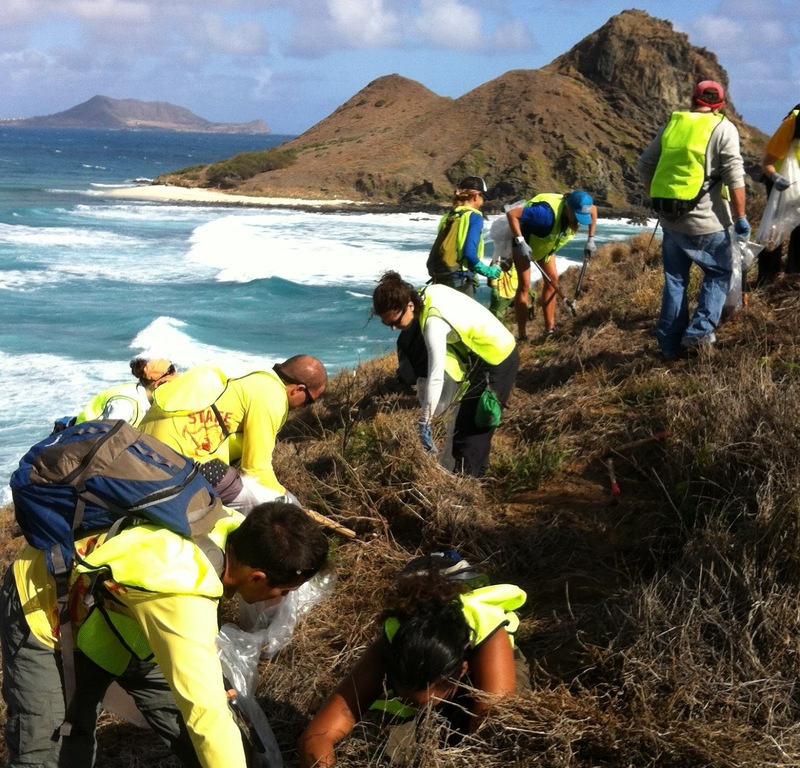 The restoration projects mainly involve removal of invasive plant species from the Mokuluas and Popoi’a Island in Kailua Bay, but have also included an annual bird count and an outplanting of over 2,000 native plants on Moku iki. In 2012, KSK participated in 15 DLNR trips to offshore islands, provided staff and volunteers, and provided almost $15,000 in in-kind contributions of equipment, staff time, and safety services. Katie Cassel has been a central figure in conservation on Kauai since her arrival on the island in 1992. Originally the Volunteer Coordinator for Hui o Laka-Kokee, Katie branched out and began the Kokee Resource Conservation Program (KRCP) in 1998. Since then she has lead over 26,000 volunteers in over 130,000 combined hours of work, resulting in the removal of over 9 million weeds on 9,466 acres. Katie has worked tirelessly to maintain a 3-4 person staff for KRCP, who maintain data on invasive plant detection and removal. Katie’s work in inspiring the community to get involved in conservation has benefited the people of Kauai and helped to conserve the incredible beauty of Kokee. Celia Smith is an enthusiastic educator of minds of all ages, and has been a driving force in Hawaii’s battle with invasive marine algae. She was one of the first people to raise public awareness of the issue, and has worked tirelessly to explore and implement control measures, including helping to design and fund the supersucker, a vacuum pump that removes invasive algae from coral reefs. She has organized regular algae cleanups for years, which are attended by community groups, public and private school classes, university students, and even members of the public who happen to walk by and join in. Hundreds of children have stood next to the ocean, listened attentively to Celia’s discussions of coral reef ecology, learning about what makes a reef healthy and how invasive species throw things out of balance. She has raised awareness regarding invasive species at tourist resorts, civic clubs, state departments, science fairs, and many levels of government. She can still be regularly found chatting up passersby at her latest Waikiki alien algae cleanup, offering them food and a limu lecture and a chance to heal the reef. The Natural Resources program within the Conservation Division of the Environmental Department, Marine Corps Base Hawaii manages natural resources to support the military mission, while preserving, protecting and enhancing these resources. The Conservation Division is staffed with two permanent personnel to manage the natural resources on over 4300 acres. The 517-acre Nuupia Ponds supports four endangered water birds (Hawaiian Black-necked Stilt, Hawaiian Coot, Hawaiian Gallinule, and Hawaiian Duck), and numerous migratory bird species that live or visit the Mokapu Peninsula. Marine Corps Base Hawaii partners with Sierra Club to conduct environmental service projects to remove invading shoreline plants. In 2008 Paul Miller, a Haiku resident on the edge of the Kokomo gulch coqui infestation, had a few coqui near his property. When the Maui Invasive Species Committee crew showed up to remove the frogs he barbequed dinner for the crew in appreciation. His support and enthusiasm have only increased over the years. Paul has spent hours of time on equipment helping the MISC crew. From mowing acres of cane grass for removing coqui habitat to offering his cherry picker for suspending spray hoses over the gulch, Paul has taken every available opportunity to volunteer his expertise and heavy equipment to help the MISC coqui crew. He’s helped crews unload thousands of pounds citric acid with his forklift, even delivering additional machinery to help. Paul’s contributions to supporting coqui control are a substantial contribution toward potentially eradicating coqui from Maui. 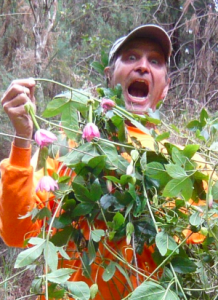 Pat Bily has consistently demonstrated his commitment to invasive species management for more than 22 years. He was an original member of the Melastome Action Committee, which subsequently morphed into MISC, which in turn spawned ISCs across the state. His work includes more than 22 years of ginger control work at Waikamoi. He has led the charge on initiating and supporting biocontrol research working with the Center for Agriculture and Biosciences International (CABI) on one of Maui’s worst invasive weed pests. Pat has worked with HDOA to obtain Special Local Need Labels for priority invasive plants to ensure highest herbicide control efficacy. Throughout 2012 he worked regularly with Dr. James Leary to develop Herbicide Ballistic Technology (HBT), the results of which will likely have a significant impact on invasive plant control throughout the state. Mālama O Puna is a grassroots environmental non-profit based in Lower Puna lead by Rene Siracusa. The organization’s invasive species programs are coordinated by Dr. Ann Kobsa, who has overseen a number of challenging projects. In 2005 Malama O Puna began working to remove red mangrove from Wai ‘Opae, which lead to federal funding for the organization to explore removal from four other sites with the goal of island-wide eradication. Malama O Puna has also tackled miconia, clidemia, pickleweed, and other difficult species. In 2012 the organization coordinated the 7th annual Puna Sustainability Expo, which educated the public regarding invasive species control. Because of Rene, Ann, and the staff and volunteers with Malama O Puna, Hawaii Island is on its way to being mangrove-free and its native ecosystems are more secure. While Tim Tunison retired from his position at Hawaii Volcanoes National Park, he continues to be involved in forest restoration and invasive species control. Tim has organized a coqui control program in Volcano (The Coquistadors), created a manual for the mechanical and chemical control of invasive plants on Kilauea, and organizes citizens for control of ginger and faya trees. Tim has had a substantial impact on the Volcano community and the surrounding environment of Kilauea.